Research In Motion (RIM) today has announced a new product to compete with tablets like Apple’s iPad, and tons of other Android based tablets with their very own PlayBook, the BlackBerry Tablet. With 1Ghz Dual Core processor, 1GB RAM, 1080p HD video playback and HDMI output, this tablet blows away the competition out of the water. "RIM set out to engineer the best professional-grade tablet in the industry with cutting-edge hardware features and one of the world’s most robust and flexible operating systems," said Mike Lazaridis, President and Co-CEO at Research In Motion. "The BlackBerry PlayBook solidly hits the mark with industry leading power, true multitasking, uncompromised web browsing and high performance multimedia." This beautifully designed and incredibly powerful tablet is ultra portable, ultra thin and super convenient for both work and play. Measuring less than half an inch thick and weighing less than a pound, the BlackBerry PlayBook features a vivid 7" high resolution display that looks and feels great in your hand. With such a unique mix of utility, performance and portability, you’ll want to take it everywhere. 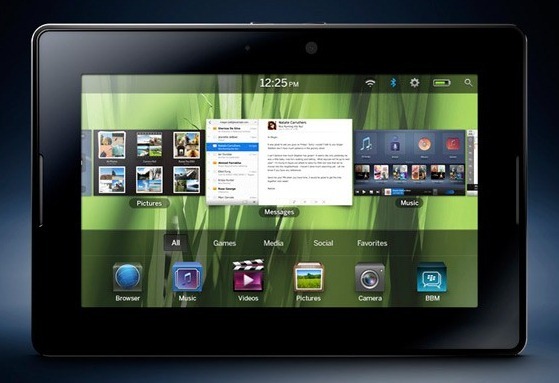 Powered by BlackBerry Tablet OS with UI designed by QNX, RIM’s PlayBook is expected to hit retail shelves in early 2011. ASUS Eee Pad is a Windows 7 Tablet that Can Give iPad a Serious Run for its Money!